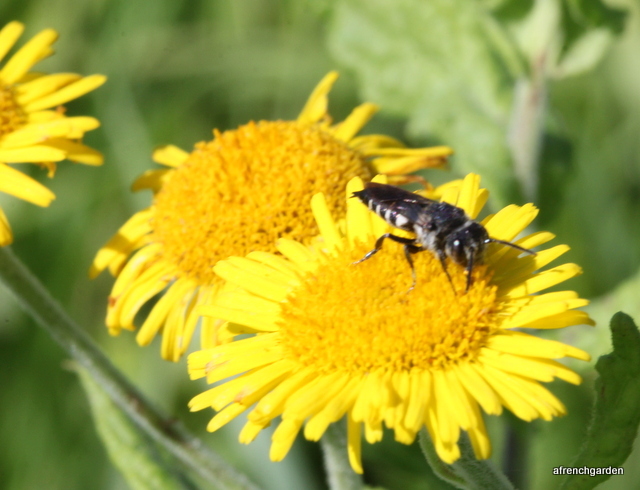 Just as the cuckoo lays its eggs to be hatched in another birds nest, cuckoo bees lay their eggs in other bees nests. 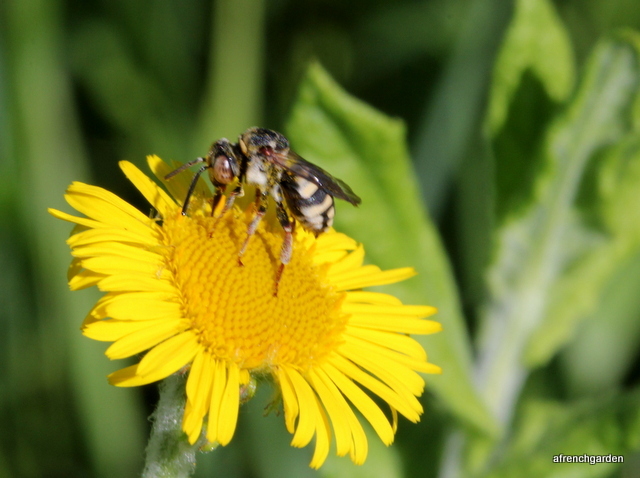 The story continues in a similar manner with the larval cuckoo bee consuming the host egg/larva and the food supply laid down for its growth by the host bee. 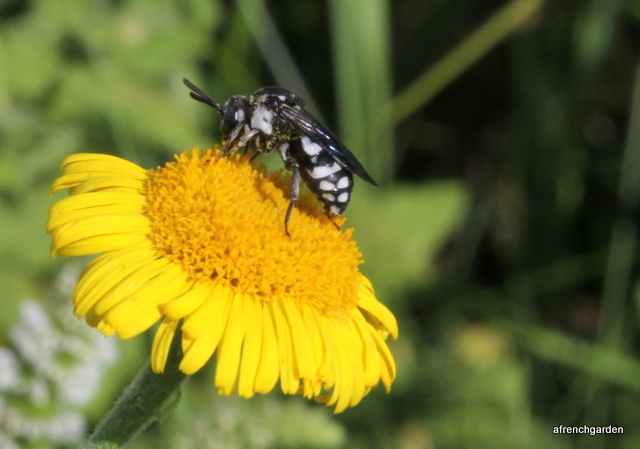 I had read about the cuckoo bees but had not seen any until this year. 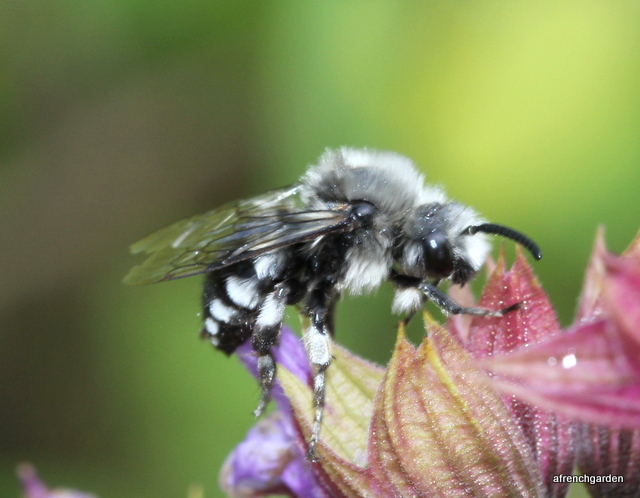 That changed at the end of May this year when I noticed a Melecta albifrons on the Nepeta in the garden. The Nepeta is still flowering and attracting bees even in late September and at the beginning of the year it attracts plenty of Anthophora. M. albifrons is a parasite of Anthophora plumipes but I have never seen any Melecta near their nests in our stone walls. 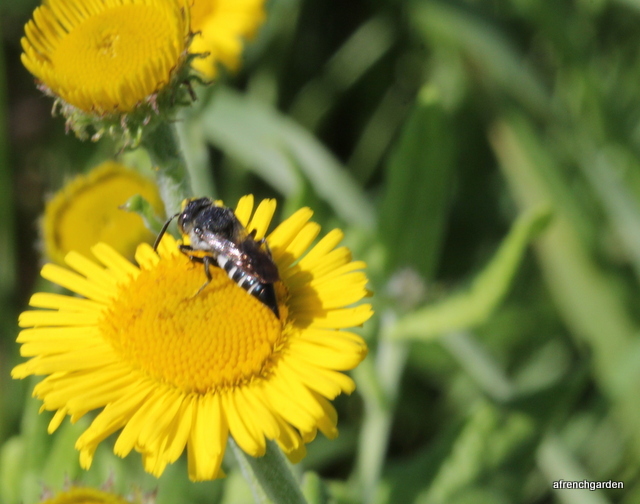 There is also a possibility that these are Melecta lucosa which parasitise other Anthophora but I cannot differentiate between them from the photographs. 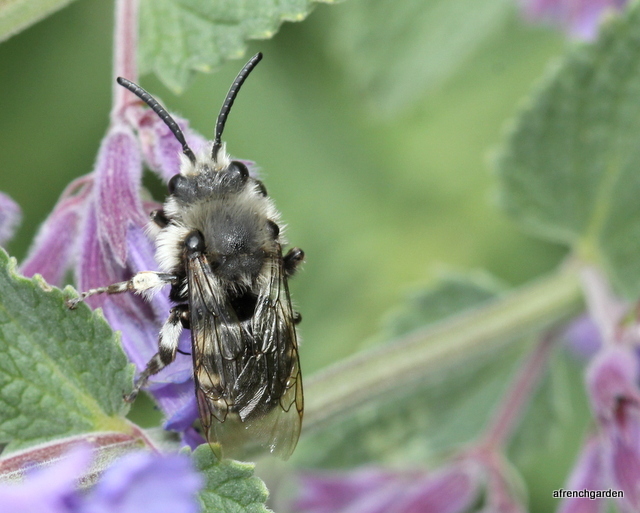 I am surprised that I have not seen more Melecta as I often watch the different Anthophora in the Nepeta and the Lavender when it is in bloom. 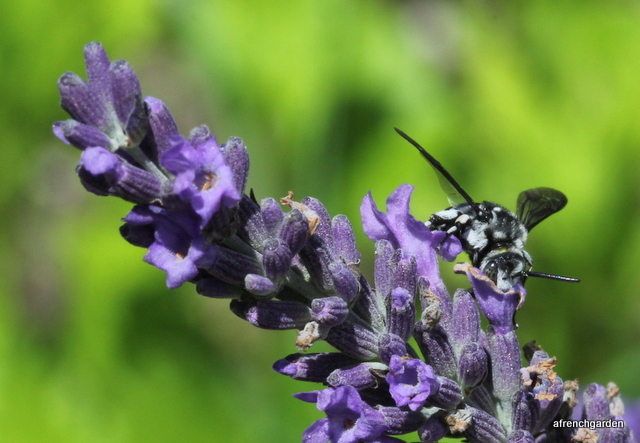 It was in the lavender in the garden at the beginning of July that I spotted the next cuckoo. I have only the genus here – Thyreus, as there are several species in France. It looks similar to images of Thyreus histrionicus that I have seen. 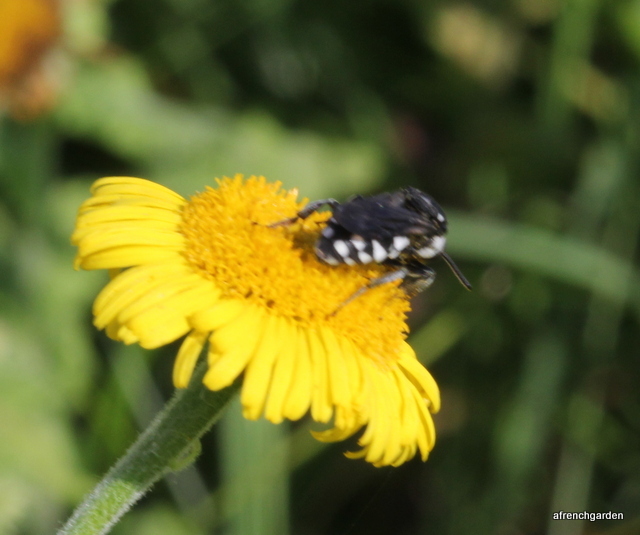 This year I have been looking at the bees on the Common Fleabane (Pulicaria dysenterica) and at the end of September I saw another Thyreus. They are quite large bees but fast movers so I did not get as many shots as I would have liked. It looked very similar to the bee I had seen earlier in the year but I cannot comment on the species. These flowers are visited by Megachiles so they would provide a good meeting place as well as a nectar feed. 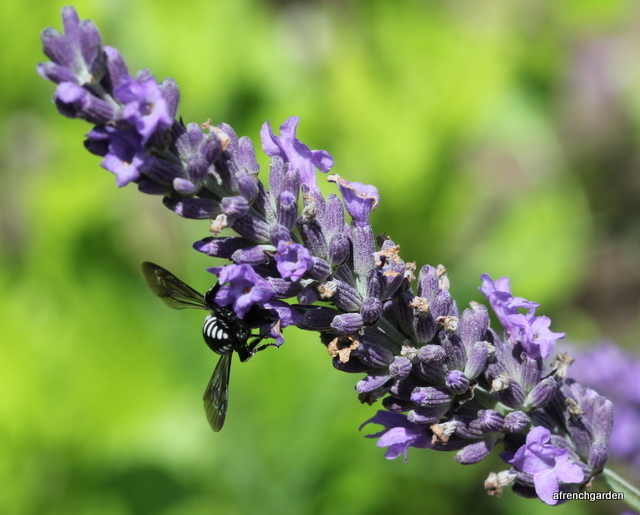 I’d really like to be able to identify the bees to species level but this is not usually possible from a shot on a flower but it is usually possible to find the genus. However, the above image taken on the 15 September 2014 has me stumped. It may be a Thyreus but I cannot find any similar on the web. I can find little information on the hosts, probably generally the Anthophorini. We have Amegilla here in the summer which is a possible host but it may also use the Anthophora. As soon as I saw this shape I knew it was unmistakeably, Coelioxys, perhaps Coelioxys elongata. These bees are related to the Megachiles whose nests they will lay their eggs in. They will also use nests of the Anthophora such as Anthophora furcata which nests in wood like the Megachiles. Watching the Common Fleabane (Pulicaria dysenterica) has proved a very interesting exercise and I found more species than I had expected. They attract a great variety of bees and it has helped to push my IDs to over twenty now.